Display case in the exhibition Beyond the Barbed Wire: Experiences of Italian Canadians in WWII. 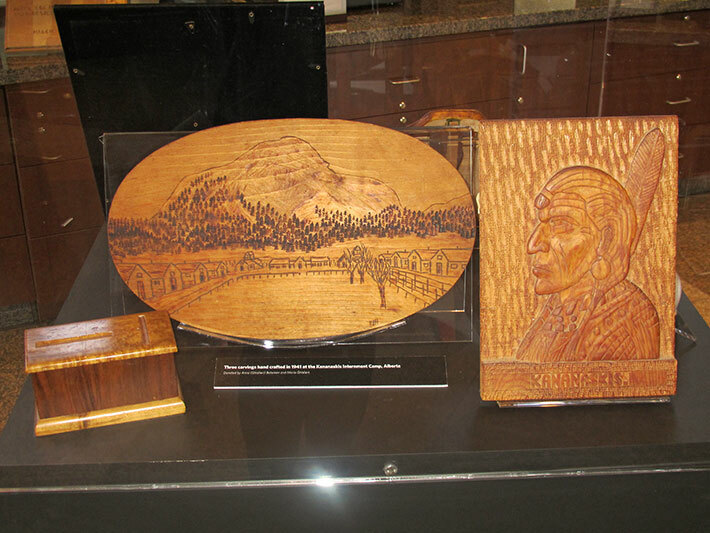 The display case contains three carved wooden objects made by internee Federico Ghislieri during his internment at Camp Kananaskis. The object at the left is a wooden cigarette box. The box features what appears to be two groves or slots in the top. The central object is an oval wooden plaque featuring an aerial view of Camp Kananaskis. An open courtyard is visible in the centre of the plaque surrounded by a number of barrack buildings. Trees and mountains are visible in the distance. The sketch of the camp was created by burning the wood. This technique is known as pyrography or pyrogravure, which literally means "writing with fire." It is likely that Ghislieri used a metal instrument that had been heated in fire to sketch the image of the internment camp. The object at the right is wooden plaque featuring the bust of a First Nations man carved in relief. The wood Kananaskis has been carved along the bottom of the plaque. Many internees brought wooden objects home to their families, including elaborate ships, mirrors, painted reliefs, jewellery boxes and serving trays. Letters from the camps relate how many of the men occupied their time by carving wood. The Italian Cultural Centre Society (ICC) in Vancouver, BC created a project entitled A Question of Loyalty, which recognized and commemorated the experiences of those affected by the internment of Italian Canadians in British Columbia during World War II. The project included a play (Fresco, written by Lucia Frangione in collaboration with the BellaLuna Ensemble) a book (Injustice Served, the story of BC’s WWII Italian Enemy Aliens by Ray Culos), and an exhibition at the Italian Cultural Centre (Beyond the Barbed Wire: Experiences of Italian Canadians in WWII). The exhibition was on display at Il Museo at the Italian Cultural Centre in Vancouver, BC from March 8, 2012 to August 31, 2012.